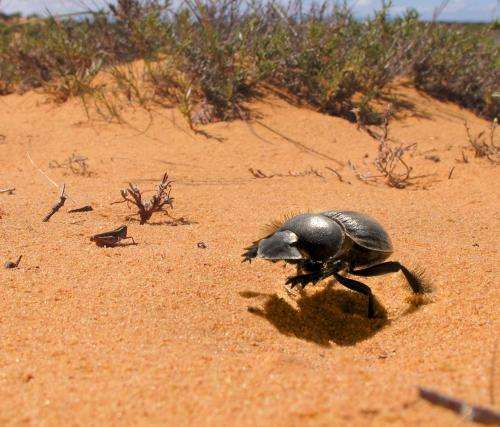 (Phys.org) —A species of dung beetle in the Western Cape has given up its ability to fly and instead gallops across the sand in a behaviour which researchers suspect evolved as a way to navigate back and forth from home. "This species of Pachysoma grabs bits of poo and gallops forward with it. That is really odd. Most insects walk with a tripod gait. They plant three legs in a triangle, while swinging the other three legs forward. It's an incredibly stable way of walking because you've always got three legs on the ground. For an insect to abandon the tripod gait and use its legs together in pairs like a galloping horse is really radical. The big question is: why are they doing it?" says Professor Marcus Byrne of Wits University. Pachysoma is also different to most dung beetles in that it collects dry dung and hoards it in a nest which it provisions with repeated foraging trips, instead of rolling one, wet, dung ball in a straight line away from competitors at the dung pile, never to return. A team of scientists including Byrne and colleagues from Lund University in Sweden think the species might have changed the way it walks because it needs to be able to find its way back and forth from its nest. "For most dung beetles, it's always a one way trip – grab the poo, run away and never go back. The very marked pacing of Pachysoma's gallop might be giving it a better signal in terms of estimating the return distance from the food to its nest. When it gallops, it slips less in the soft sand," says Byrne. Ants have been shown to count their steps as a way to navigate back and forth from home, and bees have been proven to use the optical flow of scenery across their retinas to measure how far they've travelled to forage from the hive. The team thinks the Pachysoma dung beetles are doing both. "Bees use optic flow as a measure of how fast and how far they've flown. Dung beetles have two eyes on each side of their head, one on top and one on the bottom, looking at the sand and we think Pachysoma might be registering optic flow with its bottom eye over the sand," says Byrne. "There are 800 species of dung beetle in South Africa and most of them fly. To fly makes sense because poo is a very ephemeral resource. It's only useful for a few days and it's very patchy – you don't know where you're going to find the next dropping. That's why Pachysoma is so weird. Why would anyone give up flying?" says Byrne. The team suspects that Pachysoma has sealed its wing cases to conserve moisture in the arid West Coast environment. "Breathing causes massive water loss. We think they've closed the elytra case to create a breathing chamber which keeps moisture inside," says Byrne. The unique behaviour of this galloping, flightless species has allowed it to dominate a niche market among dung collectors of the Western Cape.